Majestic Angelfish (Pomacanthus navarchus). Also known as Blue-girdled Angelfish. Found throughout the Indo-Pacific, including the Great Barrier Reef, Australia. Blue-face Angelfish (Pomacanthus xanthometopon). 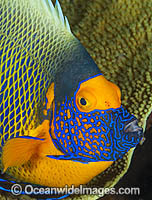 Also known as Yellow-mask Angelfish. Found throughout Indo-West Pacific, including Great Barrier Reef, Australia. Regal Angelfish (Pygoplites diacanthus). Found throughout the Indo-West Pacific, including the Great Barrier Reef, Australia. Black-spot Angelfish (Genicanthus melanospilos), male. Found throughout the Indo-West Pacific, including the Great Barrier Reef, Australia. Emperor Angelfish (Pomacanthus imperator), juvenile. Found throughout the Indo-West Pacific, including the Great Barrier Reef, Australia. Clark's Anemonefish (Amphiprion clarkii), juvenile in a Sea Anemone. Found throughout Indo-West Pacific, including the Great Barrier Reef, Australia. Geographically highly variable in colour and form. Photo taken at Papua New Guinea. Coral Triangle. Panda Clownfish (Amphiprion polymnus), with Cleaner Shrimp. Also known as Saddleback Anemonefish. Found in association with sea anemones throughout the Indo-West Pacific, with geographical colour variations. Papua New Guinea. Coral Triangle. Clark's Anemonefish (Amphiprion clarkii). Found throughout Indo-West Pacific, including the Great Barrier Reef, Australia. Geographically highly variable in colour and form. Photo taken at Papua New Guinea. Within the Coral Triangle. Panda Clownfish (Amphiprion polymnus), juvenile and adult. Also known as Saddleback Anemonefish. Found in association with sea anemones throughout the Indo-West Pacific, with geographical colour variations. Papua New Guinea. Within the Coral Triangle. Clark's Anemonefish (Amphiprion clarkii), in a sea anemone. Found throughout Indo-West Pacific, including the Great Barrier Reef, Australia. Geographically highly variable in colour and form. Photo taken at Papua New Guinea. Within the Coral Triangle. White-bonnet Anemonefish (Amphiprion leucokranos), in a sea anemone. Found in association with sea anemones from northern Papua New Guinea to the Solomon Islands. Photo was taken at Milne Bay, Papua New Guinea. Within the Coral Triangle. Orange Anemonefish (Amphiprion sandaracinos), in a sea anemone. Found in association with sea anemones throughout the Indo-Pacific. Photo was taken at Milne bay, Papua New Guinea. Within the Coral Triangle. Spine-cheek Anemonefish (Premnas biaculeatus). Found in association with sea anemones throughout the Indo-Pacific, including northern Great Barrier Reef, Australia. Photo taken in Papua New Guinea. Within the Coral Triangle. Spine-cheek Anemonefish (Premnas biaculeatus), juvenile. Found in association with sea anemones throughout the Indo-Pacific, including northern Great Barrier Reef, Australia. Photo taken in Papua New Guinea. Within the Coral Triangle.